I have to pack for a weekend away. Naturally i spent the day making a baby quilt. It turned out well, I’d say. The overall size is about 30″x40″, which is pretty standard for a new baby. 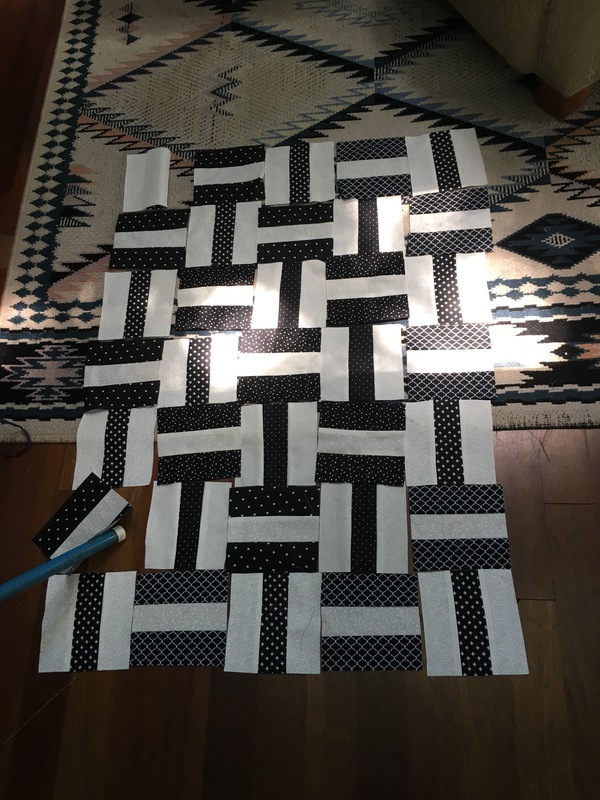 A crib quilt is about the same width but nearly twice as long: 54″ instead of 40″. The pattern more or less resembles a series of interlocking H’s or capital I’s. The front is all black and white fabrics, but they have patterns: little polka dots, triangles, nets, crosses. The white fabric is printed with white florals and spirals and polka dots. So on part of the quilt is very rigid and orderly, while the other is more fluid and natural. The white patterns are especially subtle. I am not happy specifically about the quillting. I hoped that this cool grid pattern woild manifest on the back as I quilted through from the front. It did not work as I’d hoped. I put a border on this quilt, which I have not done before. Jelly Roll strips are 2.5″ wide and 42″ long, so they’re just the right length to assemble as a border and keep the corners simple. I didn’t have bias tape, but I simply double-folded four jelly roll strips to make my edging. It was the hardest piece of the work, I think. I “stitched in the ditch” for one side to be attached, and top-stitched for the other side. Machine of course, not hand-sewing. I am not that exacting. It was an eight-hour day to make this quilt. At $25 an hour, that’s $200 in time-costs. 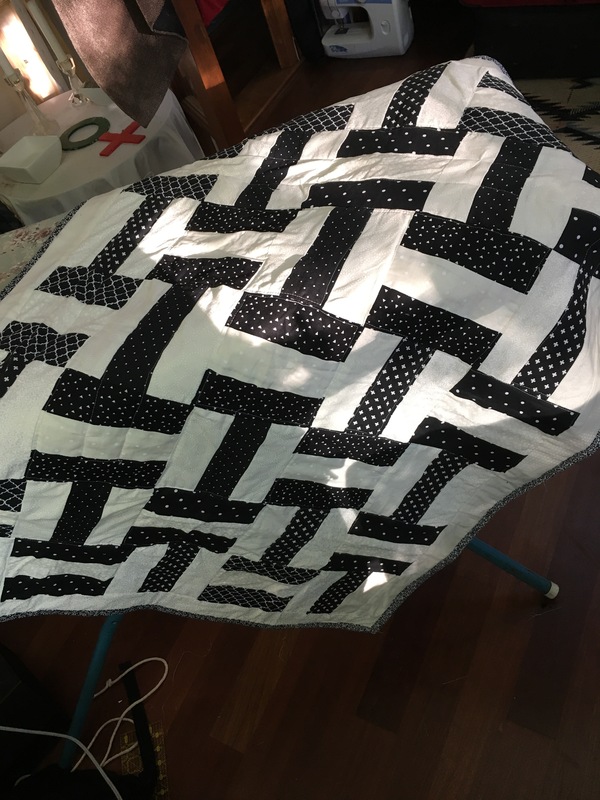 Add on $30 in materials, it’s a $230 quilt… I did some experimentation with the quilting, I think that with practice, I could get this pattern down to a four- or five-hour project…. but there are quilts where the sewing machine snags or malfunctions and then I need extra time. 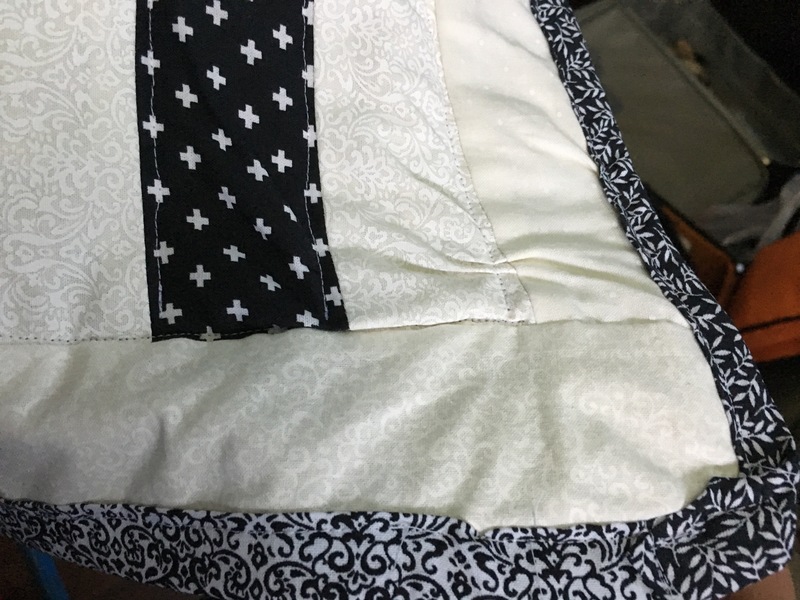 As well, the most complicated piece of the work was edging and binding the quilt. As I get more skilled at that, I may be able to cut an hour off my time. But probably not. There’s also washing — a quilt should probably be washed, and there’s a charge for water and soap and time: $40? So this is probably a $250-275 quilt if I sell it. Shipping is likely somewhere between $15-20. 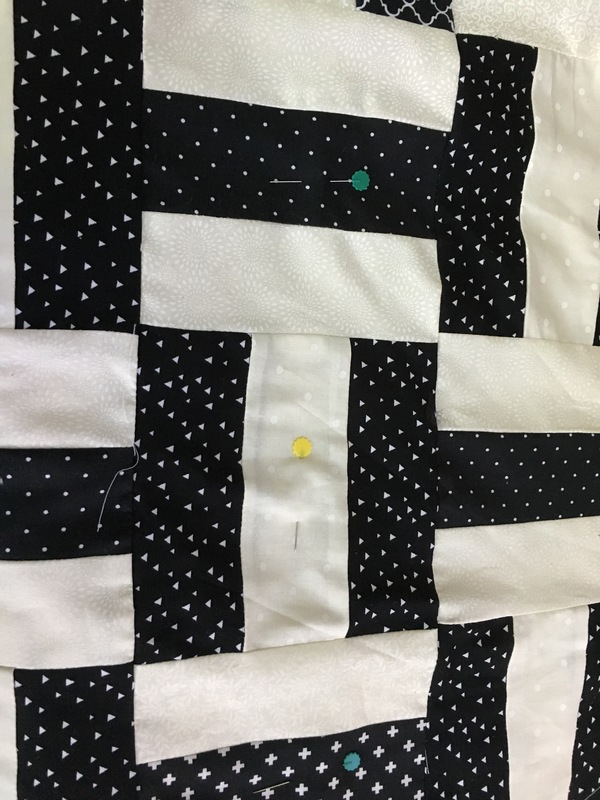 Prices on Etsy seem to confirm this: big square quilts are around $80, more elaborate pieced works are $250-300 for the baby quilt size. I’m in the right market range of time and materials, I’m guessing. All in all it turned out well, I think. Next steps: work on regularizing the quilting pattern for this quilt. Working with other colors. Matching the thread to the quilt. Buying jelly rolls on sale, and in groups to make more quilts in more or less the “same pattern” (allowing for the variant fabrics in each roll). Making all of the blocks in the two jelly rolls. 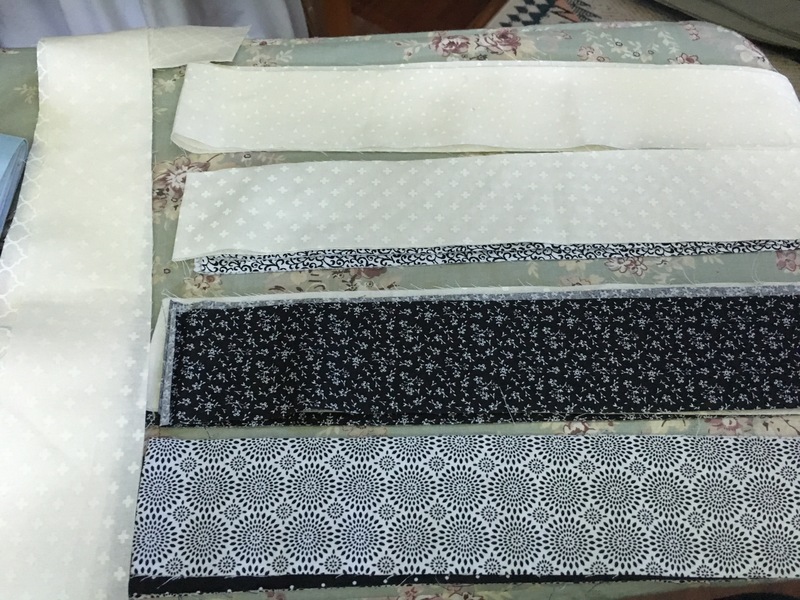 And mix and matching across all the pieces for a more interesting quilt. Leftover strips: 40% of next quilt.